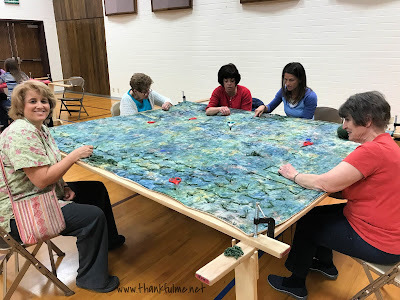 Monday, Nancy of Wyoming Breezes wrote a guest post and shared with us about the Quilts of Valor Foundation. Yesterday, I focused on JustServe.org, and how that is one resource to finding organizations that need volunteer helpers. Today, I'd like to report on what I found when I used JustServe.org. The #LightTheWorld campaign is encouraging everyone to Light the World, Light Your Community, Light Your Family, and Light Your Faith. I had ideas for the latter three, but I wanted to do something for Light the World that was more than just donating money to a cause (though that can be helpful, too, of course.) I turned to JustServe.org to see if I could find ways to participate. 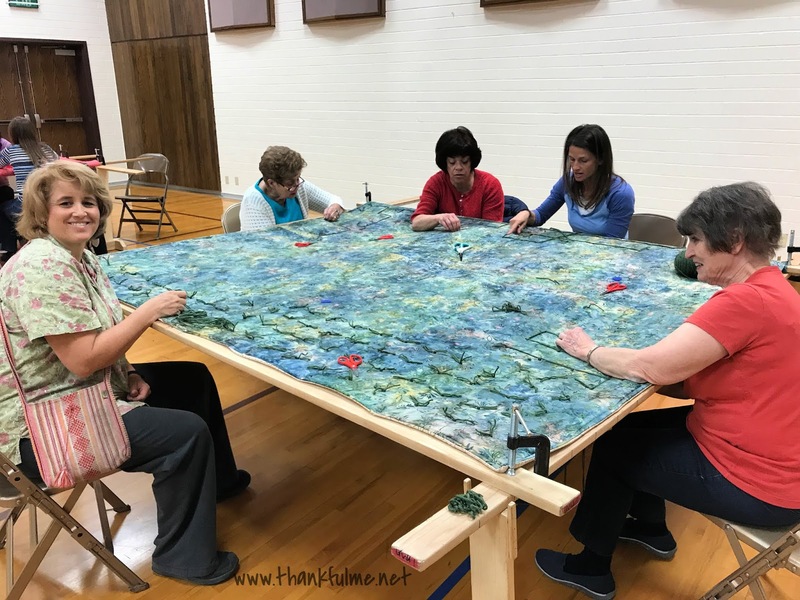 A couple of projects stood out to me: tying quilts for the Paradise, CA fire victims, and gathering supplies for Rohingya refugees who are living in Bangladesh. Stitching Hearts Worldwide was organizing quilting bees, and also was working with Lifting Hands International to round up donations of goods to send to Bangladesh. I met with Krysti, the founder of Stitching Hearts Worldwide, and she gave me some bags to fill with items for the refugees. I noticed that one of the items they were accepting was scarves. 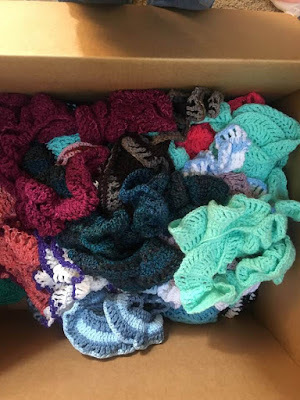 My sister-in-law had just posted on Facebook about how she had crocheted many scarves over the past year (and had invited others to make scarves to send to her), but that she was having a hard time finding organizations to accept the donations. I quickly messaged my sister-in-law and soon a big box of scarves showed up on my doorstep. I was able to add her beautiful scarves to my small donation of some household items. Krysti also invited me to come to a quilt-tying party, and I readily accepted. The quilts had been lovingly sewn by Stitching Hearts Worldwide volunteers, and were just waiting to be tied. When I arrived at the building, three quilts were on frames, and about 15-20 women were working together to get the quilts tied. As they worked, they talked about the news reports of the fire in Paradise, California. I hope that the recipients can feel not just the physical warmth the fabric provides, but also the thoughts of care that went into the making of the quilts. It is easy to be overwhelmed at news of natural disasters or other tragedies, but although we can't prevent bad things from happening, we each, in our individual circumstances, and with our individual talents and natural abilities, can do something to help others. The tendency is to poo-poo our own strengths, believing that because something is easy for us, it is easy for everyone, and to pit our weaknesses against others' talents. We are different for a reason, and our service to others does not have to require a Herculean effort to "count." If I were in charge of sewing the quilts, for example, the people in Paradise would be lucky to receive one quilt in a year. Though I have made quilts, it doesn't come easy to me. Sitting down with other women to tie a quilt, on the other hand, is not difficult for me. Both sewing and tying were required to finish the quilt; having people self-select which part of the project they would do made the task go smoother. I hope you will take the time to answer this question: What is one strength you have? Whether or not your talents benefit people in Bangladesh or Paradise; they can help someone somewhere. As you go through this Christmas season, I hope you can see how you #LightTheWorld--because I believe you do shine! I'm enjoying your Light the World posts. I hope everyone who reads the posts finds an opportunity that appeals to them. Thank you, and thank you again for sharing about QOV.